(Newser) – Japanese authorities were preparing Thursday to inspect a decrepit boat with 10 men identifying themselves as North Koreans drifting in rough seas off the northern island of Hokkaido. Coast guard officials said they were towing the wooden boat to a safer area for inspection. Officials spotted the boat off the western coast of Matsumae town Tuesday but rough seas prevented them from approaching it. The coast guard said the men communicated in Korean via loudspeakers and a message board saying they were from North Korea and taking refuge at a nearby island due to rough weather, the AP reports. It was not immediately known whether the boat was involved in illegal fishing inside Japan's 200-nautical mile exclusive economic zone. 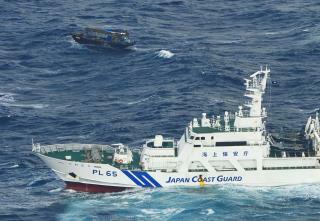 Japan has been stepping up patrols after a recent spike in the number of boats turning up on its coasts. Officials said they were linked to a reported campaign by the North to send fishermen farther out for more catches. Last week, a boat washed ashore in northern Japan with eight men who said they were North Korean fishermen. On Sunday, the skeletal remains of another eight men were found on a "ghost ship" found 45 miles north from where the first vessel washed ashore. More evidence of the Failed State of North Korea underscore the danger of Pyongyang The decrepit fleet of vessels washing up on Japanese shores and their pitiful crews are evidence, IMO of the dire condition of the North Korean economy which may seem as no news but I would point to those who give comfort and support to Kim Jong-un because Our President is Donald Trump. The spectacle of the Kim regime pursuing a Cadillac military on a stolen grocery cart economy clearly underscores the fanatical lunacy of North Korea's leadership. It is inconceivable that Kim alone could rally cadres sufficient to sustain his dictatorship and so there must be a conspiracy of a small, dedicated and equally insane elite in North Korea willing to visit genocide on their own for the sake of that tortured land. More's the pity and disgrace that Americans trivialize this misery to wage their petty vengeance on Americans who didn't vote for Hillary or Bernie. One great way to insert operatives is to send them out as "fishermen". I wonder how many NK "fishermen" are in Japan right now... maybe right outside the wire of military bases.